Even though NOESIS is provided as a library to be reused in other software development projects, it also includes an easy-to-use graphical user interface. 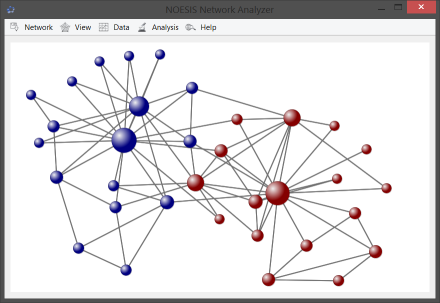 The NOESIS Network Analyzer can be used as an alternative to well-known SNA tools such as Gephi, Pajek, UCINET, or NodeXL. You can load and visualize your own networks and use all the data mining techniques implemented in the NOESIS framework using its GUI. Network visualization can be customized for nodes and links based on their attributes and different network layout algorithms are also available. Copyright (c) 2015, Fernando Berzal (berzal@acm.org) & Víctor Martínez (victormg@acm.org). All rights reserved.